Today i'm gonna show the decorator design pattern in action. 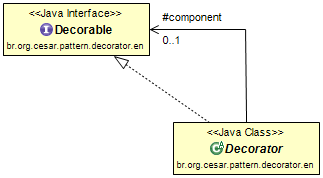 The decorator design pattern is a largelly used programming design pattern while dealing with grafics, trees and dynamic changes during runtime. It is also a greate choice if you are looking or trying to do recursion with. I love it. In this post we will implement a students decoration. We will decorate it with degrees and doctor titles. A nice example to see how it works in the real world. 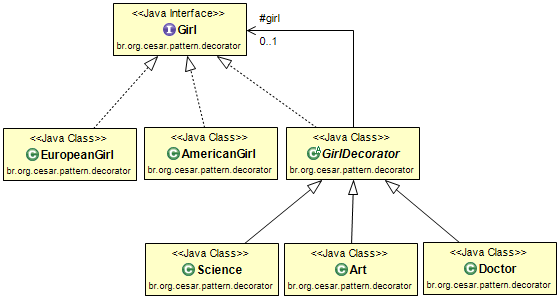 First of all, let's take a look at the UML diagram of it in its simpliest variety. After that we will take the analogy for our example. Pay close attention, because once you understand that, everything will become clear and simple to understand. That's the reason I'm putting the simplest model here first. Here we start with the analogies. The interface Girl is the decorable. GirlDecorator defines the abstract decorator's contract with the concrete decorators bellow. AmericanGirl and EuropeanGirl are the decorable that will be decorated with degrees and doctor tittles at runtime enhancing its curriculum and abilities. // CHANGED THE IMPLEMENTATION, BUT IN FACT NOT.